It’s just after 11:30 a.m. and people are wandering to the back of the Kokua Kalihi Valley Wellness Center on North School Street. They’re going to the Roots Café & Market, where the aromas of miso-glazed marlin and green papaya and tofu stew fill the cozy eatery. When Odom started working at the nonprofit wellness center in 2011, she noticed there weren’t many healthy options nearby. Many of the center’s clients, as well as some of its employees, didn’t have access to healthy food choices or fresh produce. It was the catalyst for the café and food hub market, which opened two years later in 2013. 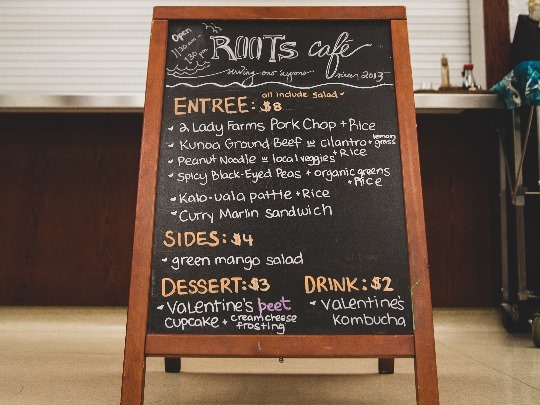 Roots Café & Market is one of more than a dozen programs of Kokua Kalihi Valley, a Federally Qualified Health Center (FQHC) started in 1972 to provide increased access to care to the neighborhood’s low-income, immigrant population. While many people visit the North School Street center to receive medical services, the café has become a hub fostering good health through food. And it’s much more than healthy food at a good price; the café supports many aspects of overall health and well-being, including education, economic stability, cultural connections, and more. Roots Café & Market sells plate lunches made with Hawai'i-grown produce, locally caught fish, and house-made sauces, as well as fruits and vegetables from Hawai'i farms. The café also makes its own tea and kombucha and hosts special events such as community food discussions, classes, and film nights. The café and market employs 15 people. Odom says the café promotes healthy food habits for its staff and provides job training. 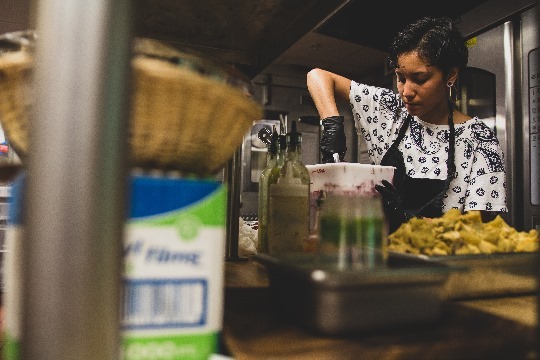 She adds that several café employees are in college studying for careers in nutrition, the restaurant and service industries, and more. Odom says that Roots Café & Market buys produce weekly from farmers and sells it to lunchtime patrons and center clients at a nominal markup. “We want to support our farmers … We can move 200 pounds of breadfruit in a week when we have it,” she says with a laugh. Not everyone can make it to the café and market for fresh 'ulu though, she says. That’s why in 2015, the staff took produce out to the neighborhood with its Crop Shop Farmers Market. Residents can use their EBT (electronic benefits transfer) cards to buy food. The mobile market is held every Thursday afternoon at Kuhio Park Terrace, just minutes from the café and market. In 2016, the mobile market expanded to Gulick Senior Center once a month. In 2018, the mobile market sold more than 19,000 pounds of produce. 1,719 EBT transactions at the farmers market. 19,195 pounds of produce sold by the mobile market. 2,241 pounds of local produce used by the café. 3,634 lunches sold in the café.